Have you read part two on the Baroque Reloaded trend and part three on the Watercolour trend? … to see what trends are going to emerge as the new year kicks off. Forget fashion, of course – I’m all about what’s new, exciting and reimagined in the home decorating space! When it comes to interior trends for 2015, there are a few that are well and truly making their presence known and about three or four frontrunners that all of the forecasters – both locally and internationally – seem to agree on. Over the coming months, I imagine you’ll see these trends worked into the photoshoots of your fave interiors mags, some of which I’m already witnessing, actually. 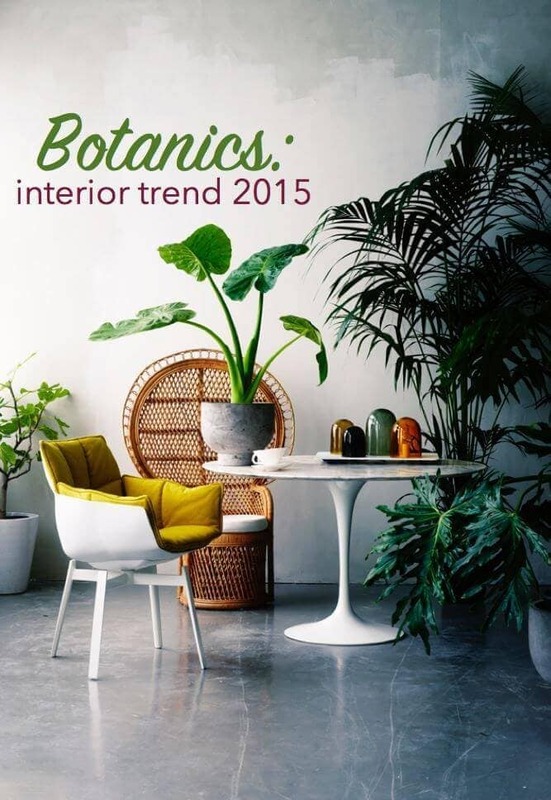 One such trend is the look I’ve named Botanics, which I’ll elaborate more on below. I’ve already seen a few publications in Australia including this trend in their pages, so it’s safe to say you’ll see it roll out into homewares and furniture shortly, too. Check back for more on other trends in the coming weeks. But for now, let’s explore Botanics! The whole concept behind the Botanic trend is that of getting closer to nature. It’s about embracing the earth, letting the outdoors come in and blurring the lines between interiors and exteriors. Late last year I noticed plants, pots and plant holders showcased in new and interesting ways in magazines and this is going to continue for 2015. The vibe is also a little moodier than we’ve seen in previous trends that included plants. 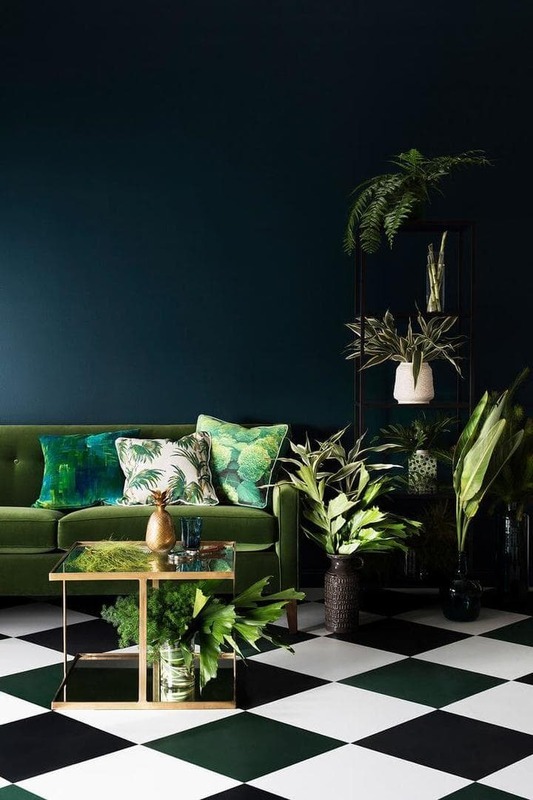 Paint colours are muddier in this look (Paint Place is on the money here), we’re set to embrace the likes of dark green feature walls and the layering of different plant varieties is a must if you want to rock this looks successfully. There’s a focus on keeping the trend lush, too, with darks green leaves and little to no flowers. There’s also a huge opportunity to play with pots and planters, but the colourway will remain simple and dark; it’s shape and pattern that’ll create the visual interest. The image above is from Haymes’ colour forecast. If you’re not into embracing a dark colour story, there is an industrial spin you can put on the Botanic trend, which will allow you to play with some more reflective surfaces. Metallics are a great way to bounce light around your space and they’ll bode well with the Botanic industrial vibe. Ensure you keep the finish of the metals in this look fairly battered and bruised though as there’s little space for high-gloss femininity in this scheme. Weathered glass and rustic timbers will add a little more grit to this trend and brick – as with a traditional industrial look – is a winning inclusion, too. Be wary not to include plants that are moving out of style if you want to rock the Botanic trend. The succulent is being retired and even the beautiful cactus is too prickly for this lush look. The image above is from Birdcage Design. The hero shot at the start of this post is from Marjory Mejia. >>> What do you think of this interior trend for 2015? Are you batty for Botanics?